Happy new year everyone! How were your holidays? I’m gonna try to go full throttle right from the start for this year’s entries. 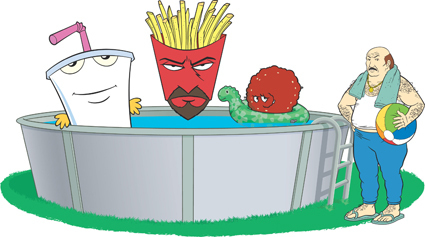 In that spirit, let’s kick 2016 off with a special Aqua Teen report! I recently found out that not only was Aqua Teen released here in Japan, it even got a dub. So I ordered the DVDs and gave them a watch - and there’re a lot of interesting differences. Before we get into that though, I should probably give a little background on the show itself! Cartoon Network has been a cable TV mainstay for cartoons for quite a while. In 2001, Cartoon Network introduced a late-night programming block called “Adult Swim”. Adult Swim shows a wide range of cartoons aimed at adults, from Japanese anime like Evangelion, Gurren Lagann, and Inuyasha, to its own original cartoons. Probably the most quintessential of those original cartoons is Aqua Teen Hunger Force. It’s a little difficult to actually summarise the show, but it’s basically about the antics of 3 anthropomorphised fast food characters and their next-door neighbour. ミルクセーキ「マスターシェイク」、フライドポテト「フライロック」、肉団子「ミートワッド」、そしてスポーツファン「カール」/ “Master Shake”, “Frylock”, “Meatwad”, and sports fan Carl. There's no continuity between episodes, and each one puts the characters in an entirely new situation. Even if a main character dies one episode, they'll be good as new for the next. Being a comedy show without any real plot, the humour comes more from the characters and their interactions. For example, Master Shake is always harassing Meatwad, and Carl is just a complete pervert. You really have to watch it to get it, but that's the basic gist. So how does a show like that get localized into Japanese? There are at lot of very American jokes, so my interest was piqued. First of all, what was released in Japan is actually the Aqua Teen movie, "Aqua Teen Hunger Force Colon Movie Film for Theaters". However, it wasn't released as a movie but rather split across 4 DVDs with the parts treated as separate episodes. but seeing as how American DVDs of cartoons usually have 6+ episodes per disc it feels a little threadbare. I was surprised to find the story of the movie itself was mostly unchanged, but there definitely were a range of more subtle differences. The biggest changes, of course, came from jokes that simply don't translate to Japanese well. For a lot of these moments though, instead of inserting a more Japanese-centric joke, the dub breaks the fourth wall and characters comment on the movie itself. Things like "Wow, this sure is American!" but in the dub they're all specifically called out, with characters saying "Hey, he's pulling this stuff again!". That said, there are also some spots where Japanese gags have been added in as well! For example, Shake frequently calls Meatwad “ウンチくん”, “Dookie” basically. Before I knew there was a dubbed version, I always thought it would be pretty difficult for Japanese people to understand Aqua Teen. Honestly I wonder what led to the creation of a Japanese version in the first place, haha. Obviously I'm not Japanese, but in watching the dub I felt like it lacked a lot of the humor of the original. It could just be that too much of it is just too difficult to localize, but still. Furthermore, releasing the movie under the guise of regular episodes makes it easy to misunderstand the feel of the show. and most of the characters in the movie originated in the show, so in the Japanese dub they have no proper introduction. It's not surprising that the Japanese Wikipedia entry treats a lot of things specific to the movie as representative of the entire series. From the Aqua Teen movie soundtrack, here's Andrew W.K. 's "Party Party Party"! Thanks always for reading to the end! There's a lot more in store for this year,so keep checking back for new entries!